NYC, 02/07/2019, 7:00PM. 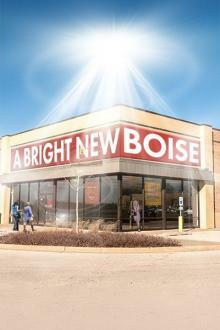 A Bright New Boise: The Meager Profits of Modern Faith. In the mundane and dusty break room of a craft store in Idaho, someone is summoning The Rapture. Will, who has fled his rural hometown after a scandal at his Evangelical church, comes to the Hobby Lobby, not only for employment, but also to rekindle a relationship with Alex, his brooding teenage son, whom he gave up for adoption several years ago. Alex works there along with Leroy, his adopted brother and protector, and Anna, a hapless young woman who reads bland fiction but hopes for dramatic endings. As their manager, foul-mouthed Pauline, tries ceaselessly to find order (and profit) in the chaos of small business, these lost souls of the Hobby Lobby confront an unyielding world through the beige-tinted impossibility of modern faith. Samuel D. Hunter's A Bright New Boise is a earnest comedy about the meager profits of modern faith. A tudent production.